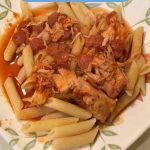 This crockpot Pepperoni Chicken with Penne recipe is a tasty light addition to your menu plan. Place the chicken breasts on the bottom of the crockpot, salt and pepper them. In a bowl whisk together the chicken broth, tomato paste, Italian seasoning, and crushed red peppers. Pour the mixture over the chicken in the crockpot. Add the pepperoni to the crockpot, on top of the chicken. Cook on low for 6 hours or on high for 3 hours, until the chicken is cooked and shreds easily. 45 minutes before serving, cook the penne following the instructions on the box. While the penne is cooking chop or shred the chicken, your preference. When the penne is cooked, drain it and add it to the crockpot. Stir together everything in the crockpot, put the lid back on and let it cook for another 15-20 minutes.